dinner after the final siena review will be at 20,30h at TRATTORIA DA DINO located CASATO di SOPRA 71! see you there after the review + studio cleanup. ragazzi! the blog is back; authors + images restored. post away, please. SIENA10 | 09/23 AUG 10 FINAL! here is the last revised FINAL SCHEDULE for SIENA! a reminder: the provincial borders are CLOSED during the palio weekend. travel is limited to the provincia di siena. there is much to see, as the thousands who flock here every year can attest. a FINAL reminder: you are free to wander 19/23 aug 10 when the return flight from rome departs. however, do NOT plan to leave wednesday night after the review! note further that you are responsible for getting yourselves to the airport in rome on time! finally, please confirm your departure date from the residenza porrione with me BEFORE 18 aug. be aware that there are check out procedures you must follow before you can leave siena. 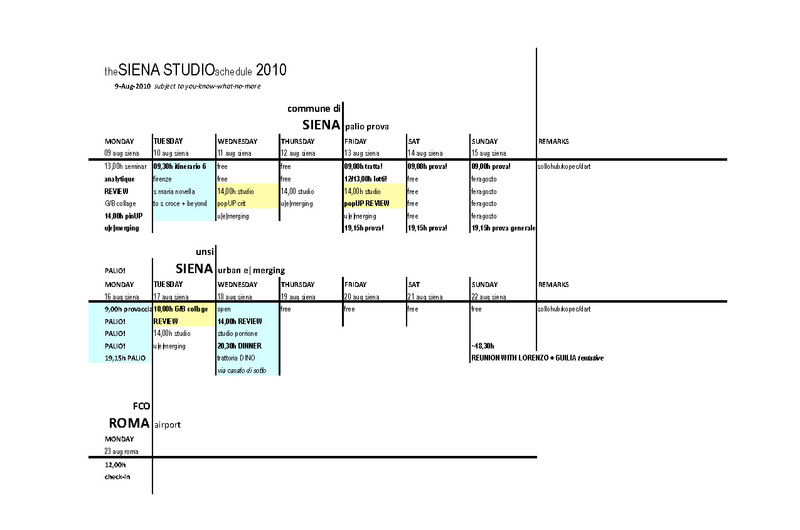 S10 SIENA SCHEDULE 09AUG10 update UPDATED AGAIN last time FOR REAL! here is the last revised schedule for SIENA (we hope). please download + review. note that the FIRENZE (florence) TRIP has been moved to tues 10 aug, as expected. the palio remains MONDAY 16 aug 10 + the review remains WEDNESDAY 18 aug 10. during the palio weekend, we STRONGLY urge you to limit your travel plans to the provincia di siena. there is much to see, as the thousands who flock here every year can attest. a reminder: you are free to wander 19/23 aug 10 when the return flight from rome departs. however, do NOT plan to leave wednesday night after the review! note further that you are responsible for getting yourselves to the airport in rome on time! 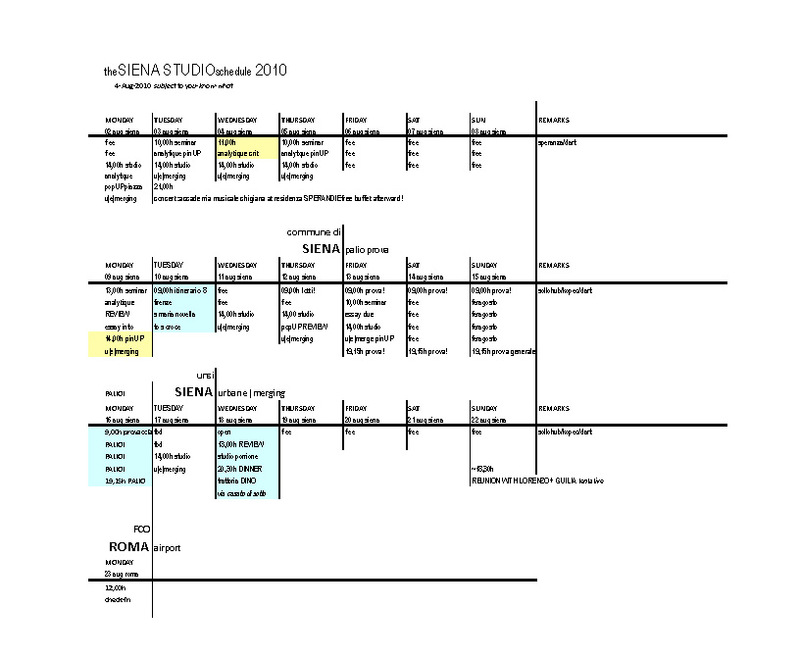 S10 SIENA SCHEDULE 04 AUG 10 update UPDATED! there is jazz in the contrade all this week + a special classical recital sponsored by the DSU (the dormitory authority) at in the garden of the residenza SPERANDIE on via sperandie (see map in the porrione lobby for location). 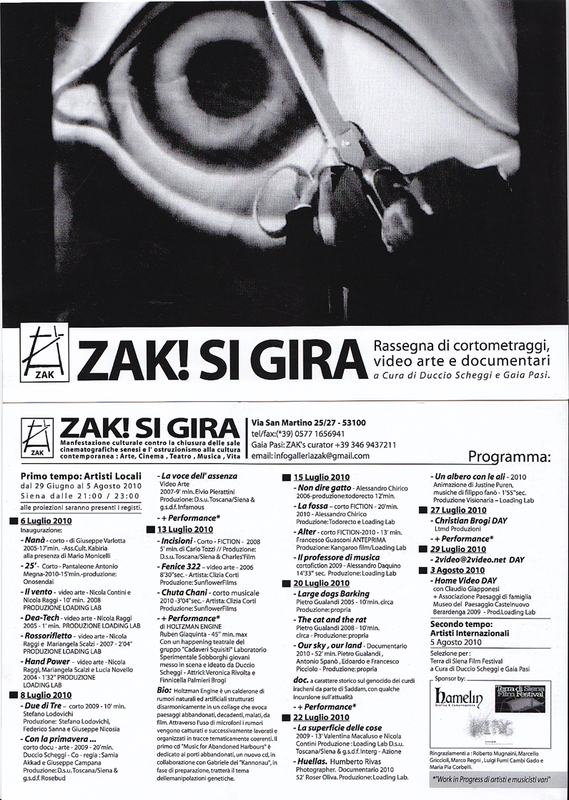 the recital features performances by advanced students at the Chigiana Music School, in Siena, one of europe’s finest conservatories, followed by a cold buffet. entry to all the concerts is free. 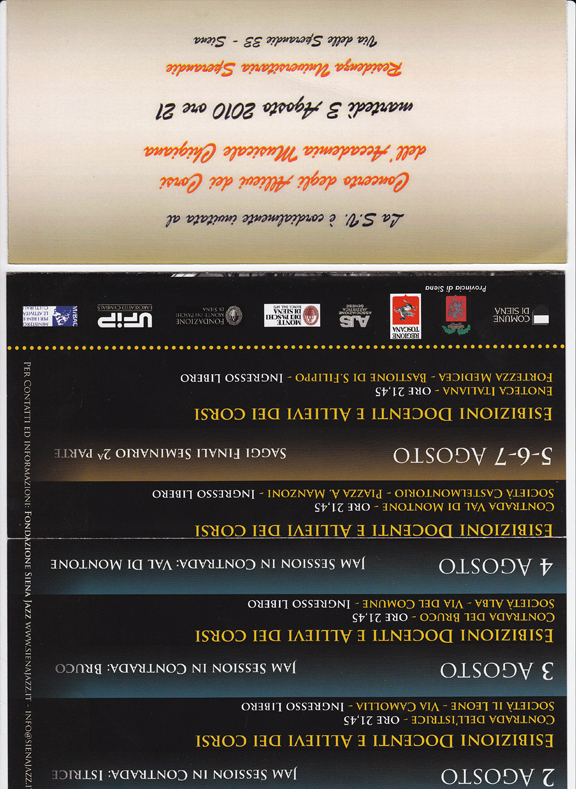 for more info, check the posters in the porrione lobby or the APT tourist office in the campo. this gallery is just down the street from porrione. note the video program scheduled for tonight … might be interesting.